Designed with the needs of conductors in mind, this flag ship of the Manhasset music stand line provides a stately and distinctive station for orchestra and band directors. This double-shafted stand has a wide and extremely stable base. The desk (32 wide by 15 12 high) is capable of holding the larger scores. With its built-in accessory ledge and storage pocket (behind the desk), the Regal provides the optimum convenience and functionality for the conductor. The height of this conductors stand varies infinitely from 28 1/2 to 50 1/2 (lip to floor) with a maximum overall height of 63 1/2inches.Features: Longest lasting, most durable music stand made. Rugged, all-aluminum,lightweight desks are ribbed for extra strength. Baked-on, glare-free, black textured finish resists scratches and chipping. Easy, automatic no-knob friction-tilt neck delivers constant tension at any tilt position. Solid-brass bearings, greaseless heavy-duty chrome inner shaft, and the original counterbalanced Magic Finger Clutch provides one-hand friction grip. Secure at any height, even with a heavy load of music. Heavy-gauge, all-steel welded base provides excellent stability and requires minimum space on stage risers or in storage. 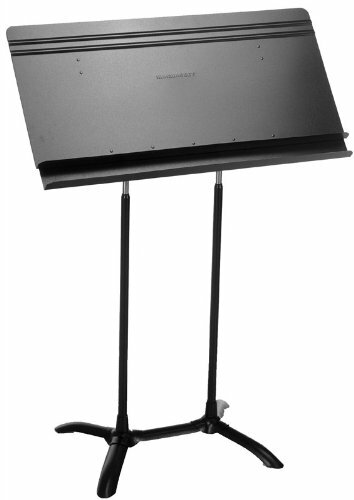 All the components of the Manhasset Music stands are available and can be purchased separately too. This includes all models of desks, shafts, bases, and all pieces of hardware and fasteners. This double-shafted stand has a wide and extremely stable base. The desk (32" wide by 15 1\2" high) is capable of holding the larger scores.